The First Look was based on original V1.0.0.68_1.0.16 firmware, which lacked support for guest networks. 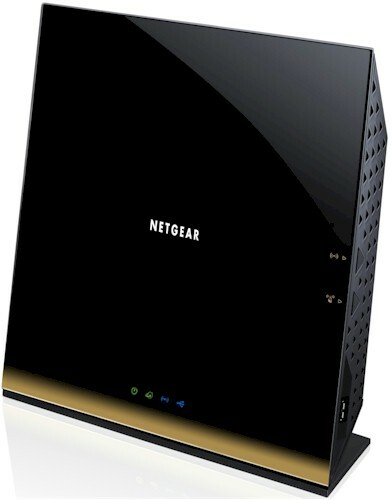 NETGEAR has since posted three updates with the lastest V1.0.2.14_1.0.23 firmware including both the missing guest networks and, according to NETGEAR, providing some improvements in draft 11ac mode performance. So this review includes a retest of 5 GHz 80 MHz mode tests as well as 2.4 and 5 GHz testing with our standard Intel 6300 three-stream N client. NETGEAR has posted the R6300's User Manual, so I was able to grab my usual front and rear panel annotated views shown below. As noted in the First Look, the two USB ports are 2.0 and there is no indication on either the front or rear panels of wired or wireless network activity. An anonymous donor was kind enough to open up the R6300 and pass along some photos. The photo below shows six antennas—three for each radio. Removing the board and flipping it over shows all key components with heatsinks or spreaders. The mini-PCIe module at the left of the photo looks awfully familiar. It's safe to say that it's the same one used in Buffalo's WZR-D1800H router and WLI-H4-D1300 bridge. Some digging around has confirmed that the components used in the R6300, aside from the 5 GHz radio, are the same as used on the WNDR4500. The component summary below pulls all the details into one handy place. The components are the same used in the Buffalo draft 11ac products except for the switch, which is a BCM53125 in the Buffalos.